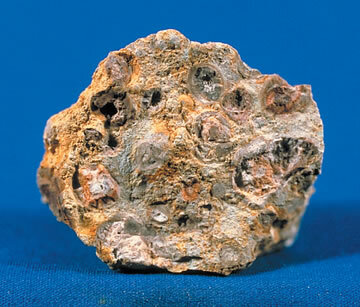 Bauxite: photo courtesy of Mineral Information Institute | Minerals Database: Aluminum & Bauxite. Bauxite was designated the official state rock of Arkansas in 1967. Arkansas has the largest high-quality bauxite deposits in the United States (located in Saline County). Bauxite contains aluminum ore which is used to make soft drink cans, aluminum foil, and many other products. During WWII, the state of Arkansas is furnished over 98 percent of all bauxite mined in the United States for aluminum production.